Inventory screen within LinnLive allows you to see all the items you have in your inventory in Linnworks. Here you can search, browse, edit your stock items, as well as create listings and adjust them. From the Inventory screen you can see which items are listed on your selling channels and if listings have templates in LinnLive. To show all your items, click Search button. The system will load the list of items you have in your inventory. Maximum 500 items can be shown per page. You can browse through the pages from the bottom part of the screen. Top row of the screen (Fig. 1.1) provides information on the amount of listings that have been processed (green), amount of listings that will be processed in the next batch (blue) and amount of listings that could not be processed due to error(s). Counter in this row indicates how many minutes is left until the next batch job will be sent to process listings. 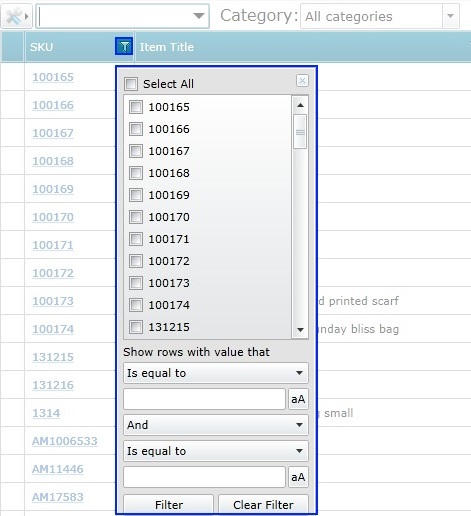 Settings button allows you to hide variation products from the list and select stock location the quantity of stock items will be derived from (Fig. 1.2). Category - if your inventory items are assigned to different categories in Linnworks, you can limit inventory search in LinnLive to display items belonging to a certain category only. Clicking on down-arrow will open the list of all categories. Not Listed + Subsource_name - displays all items that are not listed on the channel. Errors + Subsource_name - shows items with errors in listings on the selected channel. Listed + Subsource_name - shows items that are listed on the channel. Show all - displays all inventory items. SKU - Stock Keeping Unit, unique item number. Item Title - Linnworks item title. Available quantity - stock level of items in the selected stock location. On Order - amount of items currently in Open Orders. Columns on the right hand side of the Inventory grid provide information about your listings on each selling channel integrated in LinnLive. Source – the name for the channel. SubSource – the account on the channel. Stock from location – location where the stock level is derived from. Regular search lets you look for an item either by its SKU or by its title. Extended Search window has more options (Fig. 4.1). Extended search will open, if you click down-arrow in the Search field. Clicking green plus symbol under Product details or Extended properties enables searching by item details or its extended properties. Full list of product details and extended properties which can be chosen as a search criteria is provided in the respective drop down menu. Note: you can choose several Product details and Extended properties to be included in search by clicking the plus symbol several times. Ticking Show only changed products check box will display only items, whose details have been edited (in Listing Descriptions tab) but not updated on the channel yet. Such items have three exclamation marks next to their SKU and one exclamation mark next to the number of listings listed on a specific channel (Fig. 4.2). Note: If after changing item details you do not update the listing, the item will be marked with exclamation marks for 7 days only. After that exclamation marks will be removed by the system. If you want to save the search criteria you used in Extended Search window, give your search a name and save it. This will allow you to use the same search later without having to specify all the criteria once again. Clicking filter symbol next to each column title will open up menu containing the list of all values existing within this column (Fig. 4.3). Grey colour highlights cells for listings that are currently being created, updated, deleted or worked on. Red colour is used for marking listings with errors (items have not been listed on the channel or update of the listing failed due to an error). Numbers in bold mean that the item is listed on the channel and has a template in LinnLive. Numbers in regular font mean that the item is listed on the channel but there is no template for it in LinnLive (listing is linked with inventory in Linnworks). It is not possible to update or delete such listings in Linnlive. Copy- copies the title of the item. Edit Item- opens a separate window where stock item details are recorded. This information can also be found in Linnworks Inventory. Description - contains your stock item details and pictures. 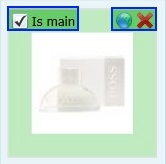 If Is main check box (Fig. 6.2) is ticked next to the image, then the image will be the first in the list of your product images in LinnLive, and by default will be set as the main image for your listing. You can delete image by clicking on red cross in the corner of the image. Clicking on globe symbol will open the image in a separate window. Postage Definition - contains default postage details, weight and measurements of the package, as well as the packaging group the item belongs to. Box with default units of weight used in your system is contoured in red (Fig. 6.3). Listing Descriptions - If you want to adjust a listing, information for adjustment will be taken from this section. More information about adjustments can be found in How to adjust a listing? section. 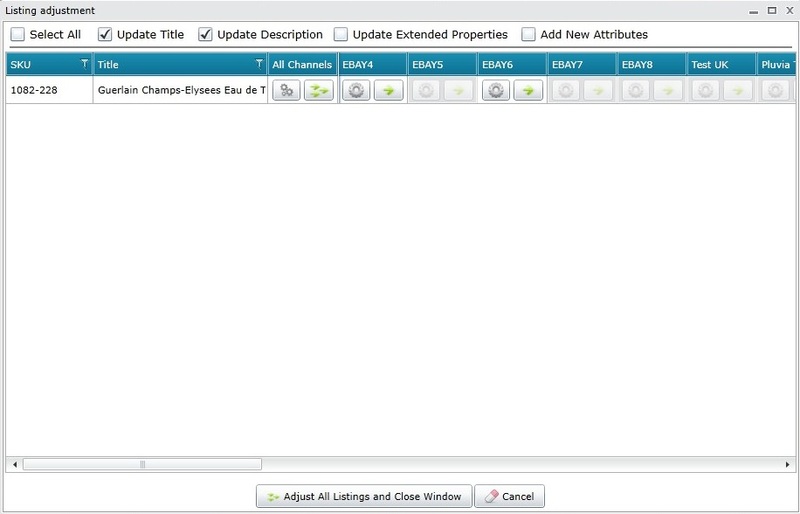 Extended Properties - here you can add, delete and edit extended properties of the item. - to enter a new desired selling price for each channel. 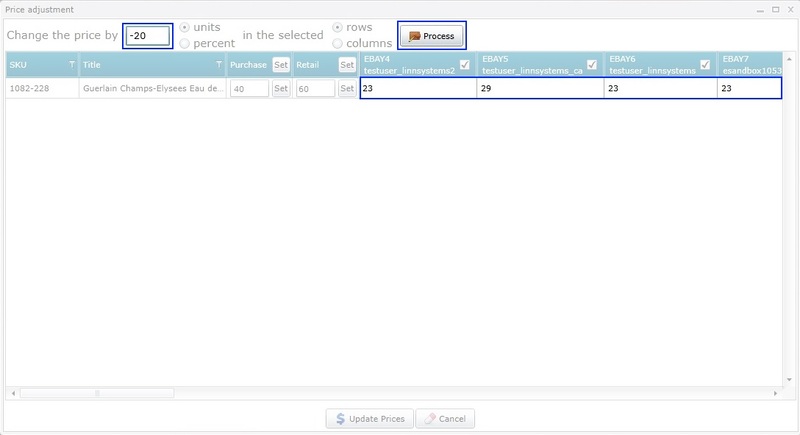 When changing price by units or percentage, you need to enter the desired value in Change the price by box and then select the item that you want to apply changes to. Clicking Process button will show you what the price will become, if you confirm changes (Fig. 7.1). Title - if you have changed the product title for a channel in Listing Descriptions section, you can update the listing title from here, by ticking the respective box. Descriptions - if item description on a channel has been altered in Listing Descriptions section, you can update it in the listing from here, by ticking the respective box. Extended Properties - if values of extended properties have been changed, they can be updated from here by ticking the respective box. If you have added new Attributes to the configurator that was used for submitting the listing, you can add these attributes to the listings from here, by ticking the appropriate box. You also can view/edit your listing details on the channels it is listed on using View Details button (Fig. 8.2) button located under All Channels. - adjust the selected listing on all the channels where the item is listed. Adjust on all channels button (Fig. 10.1) located next to View Details button lets you update a listing on all the channels where the item is listed. You need to tick respective check boxes at the top of the window with the parameters that you want to have updated, prior to clicking this button. View Details and Adjust on Current Channels buttons (Fig. 10.2) exist for each channel as well. They work the same way as described above but for a specific channel only. Copy - copies the number. Edit Selected - opens the Listings screen (window where you can see the selected listings' details). Depending on the channel where the items are listed, respective window will be opened. Show All Errors - opens a page where all listings with errors on current channel are listed. Create Listings (is not available, if there is an error with the listing and it is highlighted in red, or if it is busy and is highlighted in grey) - opens up a list of configurators that you can choose from to create listings. Note: If you have specified a configurator in the item's extended properties (option is available only for eBay), or you want to choose different configurators for different listings, you should choose Create Listings Without Configurators option. This will open the Listings Screen where templates for each listing will be displayed. If there was a configurator specified in extended properties, it will be picked up by the system. You will have to hit Create button against the template to create a listing. If no configurator was specified, you will have to select a configurator you want to use and then click Create button. Price Adjustment - offers the same options as Adjust Prices but for selected channel only. Listing Adjustment - offers the same options as Adjust Listings but for selected channel only. eBay and Amazon listings have an additional option Update Images. It should be used when the listing image has to be changed. 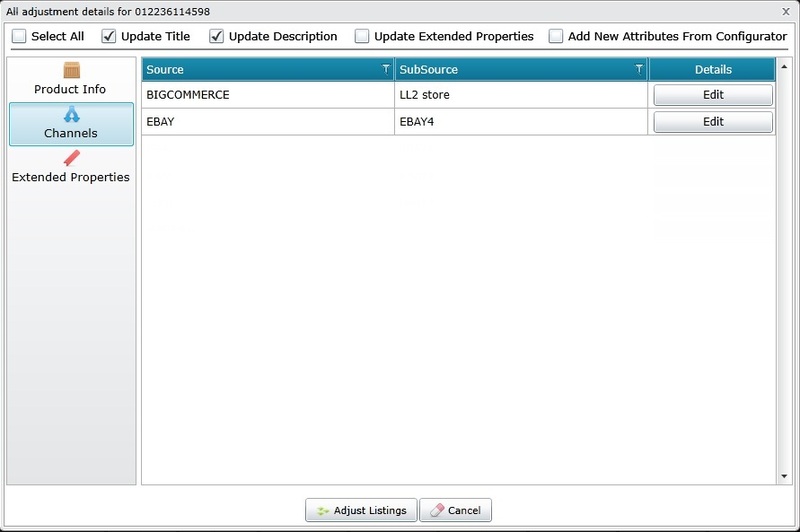 In order for it to be changed extended property EBAY_IMAGE1 (or AMAZON_IMAGE1) has to be specified for the product. This extended property should contain image URL as value. During adjustment Update Images box has to be checked for EBAY_IMAGE1 to be used as the listing image. Note: Ticking this box will disable any other image than the one specified as EBAY_IMAGE1/AMAZON_IMAGE1 and EBAY_IMAGE1/AMAZON_IMAGE1 will be updated. Adjust Prices - will adjust price on the channel. This implies that price for the channel has been changed but have not been updated yet. Adjust Titles - will adjust title on the channel. This implies that title for the channel has been changed but has not been updated yet. Adjust Descriptions - will adjust item descriptions on the channel. This implies that description for the channel has been changed but has not been updated yet. Adjust Prices + Titles + Description - will adjust all mentioned parameters.